The plush Peter Schreyer designed Kia K900 was the first rear-drive Kia sedan – before the Stinger became hot property. Power comes from two available sources, a 3.8 liter V6 developing 311 horsepower and a 5.0-liter V8 generating 420 horses. Both models are rear wheel drive, and both make use of an 8-speed automatic transmission. 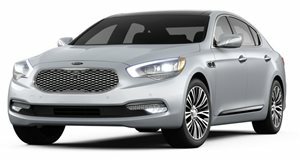 All K900 models are generously equipped, though optional features include seats with up-rated adjustment options, and ventilated and reclining rear seats. Available safety equipment includes lane departure warning, blind spot monitoring, and autonomous emergency braking. Kia builds a full-size luxury sedan to rival the likes of the BMW 5 Series; who knew? Despite being the king of the hill at Kia, the Peter Schreyer designed K900 goes fairly under the radar for the Korean brand. Based upon the same rear-drive platform as the Hyundai Genesis and Genesis G90, the K900 is the brand’s first rear-drive model – but it arrived in 2012 at a time when driving dynamics weren’t the focus of Kia, value for money was. There are newer rivals focusing on the same thing, but they also offer compelling driving dynamics to boot. How does the aging K900 fare? Ingress and egress into the K900 are made easy with a tall roof and wide door apertures, though rear passengers need to duck just a little to avoid the sloping roofline. Once inside, the standard 8-way power adjustable driver’s seat is easy to get into a comfortable seating position, with great visibility all round surely a byproduct of Schreyer’s experience at Audi. A heads-up display available on higher trim levels is nifty, but making adjustments is quite the process. The infotainment system lacks intuitiveness until you learn the system. The interior space is well-packaged, though the center tunnel impedes on driver legroom a little. Up front, head room is decent, but a little less so in the rear. It’s not unacceptable, but not class leading by any margin. However the rear leg room is abundant. Material quality is good, but not as luxuriant as German rivals, and it shows its age compared to newer Kias. Pull out from a parking lot, and the K900 feels great – the light steering effort makes maneuvering the big sedan effortless. But that’s the only place it really feels suitable. On the road the effort is too light, the feedback is severely lacking, and bumps in the road send the wheel shuffling in hand far more than it should. The ride comfort is cushy at the expense of support around corners, where the K900 wallows from side to side. Over rougher roads, the suspension doesn’t respond quickly enough and the secondary ride isn’t as compliant as we’d like. Grip levels are lacking, making this the least enjoyable car in segment to drive hard. The brakes too are disappointing, even for a big sedan. But if there is one place the K900 does exceedingly well, it’s the insulation from the road – both tire and wind noise are nonexistent in the cabin. Sending power to the rear wheels, you have the option of two engines. The base engine is a 3.8 liter V6 gasoline motor with outputs of 311 horsepower and 293 lb-ft of torque. The V6 is mated to an 8-speed, electronically controlled automatic gearbox. 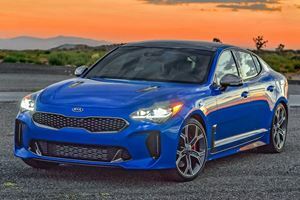 Buyers can also opt for a more potent V8 engine, 5.0-liters in displacement and developing a segment sufficient 420hp and 376 lb-ft channeled through a shift-by-wire 8-speed automatic. The V8 has good poke, but the slushy automatic transmission is comfort orientated rather than sporty. EPA combined figures are 20- and 18mpg for V6 and V8 respectively. What the K900 lacks in driving dynamics, it makes up for in standard kit – bang for buck being the K900’s key selling point. Three trims exist, V6 Premium, V6 Luxury, and V8 Luxury, with the Premium model offering 14-speaker audio, navigation, front and rear cameras, three-zone climate control, and cruise control. The Luxury models get a surround camera system, 17-speaker audio, Nappa leather with optional 16-way power adjustment and steering mounted paddle-shifters. 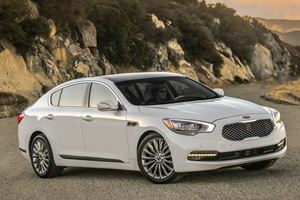 The K900’s extensive safety repertoire of available autonomous emergency braking, lane departure warning, and blind spot detection are on par for the segment, though the K900 hasn’t been crash tested locally. A soft, comfortable demeanor and bang for buck attitude may once have cut the mustard in this segment, but not anymore. 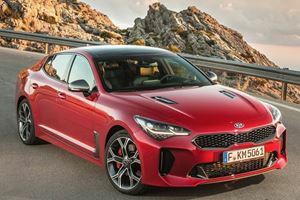 The Kia K900 is outdated, lacks quality materials and intuitive controls, and lacks the keen driving dynamics of nearly every alternative that is now equally as well kitted. When will dealers learn to stop adding markups on popular cars?